Tea that was planted 50 years ago at the UC Kearney Agricultural Research and Extension Center may revive interest in growing the popular beverage in the San Joaquin Valley, reported Dale Yurong on ABC30 Action News. The reporter visited the 330-acre ag research facility Jan. 2 to get a first-hand look at what center director Jeff Dahlberg calls a "beautiful hedge." In fact, the 13 landscape shrubs represent the best tea cultivars grown at Kearney when Lipton Tea was funding research to determine whether the Valley soils and climate could support production of plants to be used to manufacture instant tea. Today, a new trend is clearly brewing, Yurong said. "Folks can't get enough tea," he said. A researcher at UC Davis, who learned of the tea plants from documents stored by the campus' new Global Tea Initiative, was surprised to learn that the 50-year-old tea plants have survived and thrived. UC Davis chemistry professor Jacquelyn Gervay-Hague plans to study the soil where tea is growing to learn about the impact microbes in the rootzone may have on the health attributes of brewed tea. 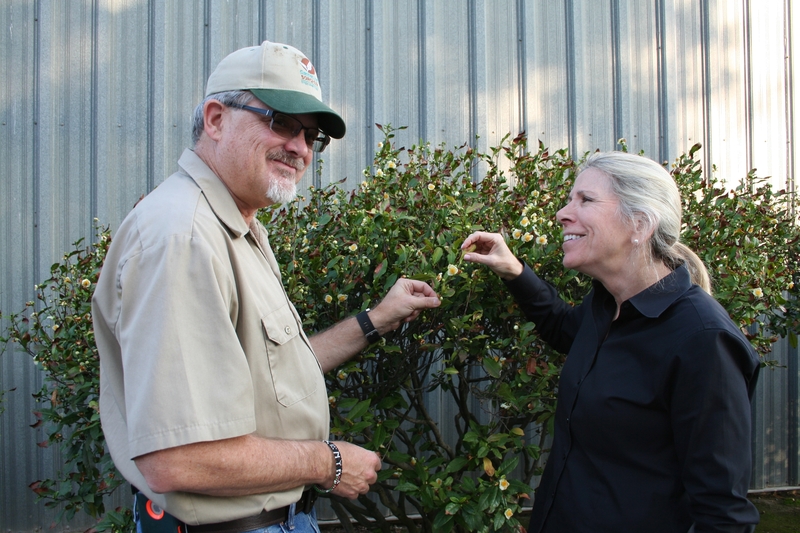 Dahlberg has looped in the small-scale farm advisor for UC Cooperative Extension in Fresno County, Ruth Dahlquist-Willard, to research tea production at Kearney. "I think (tea) does have potential for some high-value tea products," he said. "And I can really envision some small farmers getting involved in this." Jeff Dahlberg, left, and Jacquelyn Gervay-Hague stand in front of tea plants in a landscape border at Kearney. Read more about the tea at Kearney here.